Lunging and barking at other dogs while on leash are two common behaviors associated with reactive dogs. Your dog’s reactivity can be due to fear and aggression, or excitement and over friendliness. 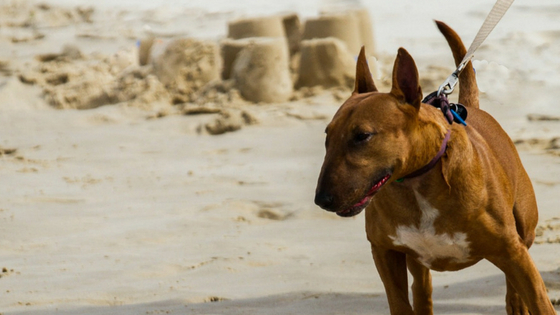 In most cases, a dog’s aggression and reactivity usually stems from a lack of confidence. They are unsure of what’s going on in the situation around them, so they often take measures to protect themselves. 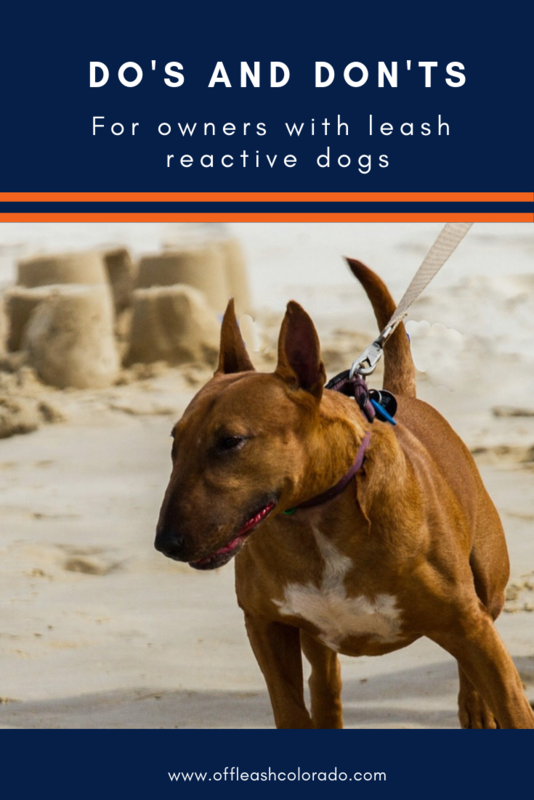 But reactivity is not always directed towards other dogs either. Your dog may also be reactive to people. Regardless of the trigger, you need to understand your dog’s behaviors before you can correct it. We’ll reveal how our trainers work with leash reactive dogs with some key do’s and don’ts. The first thing you should do is consult a professional before trying to determine if your dog is reactive, aggressive, or frustrated while on the leash. From there your trainer can identify which methods you can use to help you gain control of the behavior. You should never take your dog off-leash to see if they are reactive or not. This can put you, other people and animals in danger. If your dog does react, you won’t have a way to bring them back under control quickly, which could result in a nasty conflict or injury to another party. Regular obedience training will teach your dog to listen to you in all circumstances. Perform a range of short basic obedience sessions 2-3 times a day at home and in your yard. Eventually you can move onto your driveway and in the street where there are greater distractions. Consistent training in various environments will teach your dog to stay focused. Then when you’re using distraction techniques they’ll know to give you their full attention. When your dog reliably understands commands such as “leave it”, you can use this command to curb the reaction before it happens. Training provides structure. There are rules we as owners follow and we teach the dog to follow. We must follow through with commands and be consistent. Because those rules never change your dog gains confidence and learns you are a strong enough leader to make decision for them. Therefore deferring to you and your decisions before taking things into their own hands. It also teaches them to make better decisions down the road because they are more confident. Avoidance rarely works as a long-term, practical solution as you may find yourself in situations when it’s not possible. For example, if people and dogs are approaching from both directions in the street and you have no escape route. Our trainers adopt a more effective approach, but it’s not a DIY tactic you should introduce alone. When we work with clients and their leash reactive dogs, we emphasize working at a distance to known triggers. We keep their dog at a distance they’re comfortable with initially (i.e. 50-80 yards from other dogs). When their dog can consistently and reliably walk calmly, we’ll start gradually moving closer a little at a time. The aim is to build on the successes and not rush it. Go at your dog’s pace to ensure they feel comfortable at all times. Positive distractions can be a great way to divert your dog’s attention from their trigger, but the reward must out-way the distraction. You should understand your dog’s motivators before attempting these methods. Food: Your dog has to LOVE food in order for this to work. Because dogs will weigh their options between reacting to the trigger and being given a treat, a food focused dog may choose the treat. However, timing is everything. You’ll need to produce the food reward before your dog has a chance to react, or you may end up reinforcing bad behaviors. Squeaky toy: Some trainers have had more success with a squeaky toy over treats because the sound is more likely to grab the dog’s attention. But you must understand your dog’s motivators and consider if the distraction will out way the reward. Ask for a command: Asking for commands can help redirect your dog’s attention. But unless you have a head collar on your dog and can gently pull their head around to break eye contact, your dog may tune you out. If your dog is reactive on leash, we encourage you to contact a professional trainer who can help you identify and perfect the techniques that will work for your dog. Because everyone, dog and man alike, deserve a calm, safe, enjoyable leash walk! 2 Week Board & Train – You drop off your dog at one of our facilities for a two-week stay, our dog trainer work multiple times a day with your dog. After 14 days, you pick up your dog that now has mastered obedience, even with distractions.